Remember the Brady Bunch? Remember Alice who was always smiling in the background, cooking and cleaning? Can she please come live at my house? But then you'd have to deal with Sam The Butcher skulking around your back door. 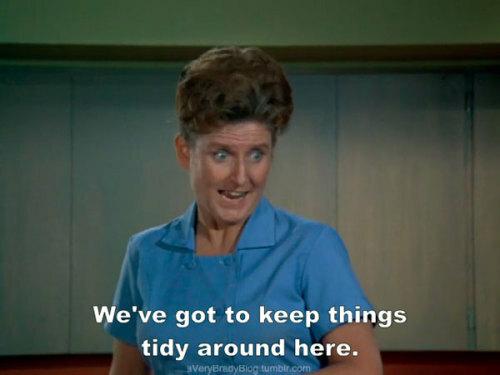 She was pretty handy at the Brady house. Just remember, Alice doesn't drive. She couldn't do it all! But Sam might come in handy, too! I can get a good price on chicken! Wow wouldn't that be great! She was so efficient on that show wasn't she? Ha ha ha. That cracks me up.